Director Frank Coraci (The Wedding Singer, Click, Zookeeper) brings us Here Comes the Boom starring Kevin James, Salma Hayek, Henry Winkler and Bas Rutten. James plays disenchanted biology teacher Scott Voss who spends his days sleeping in and ignoring his students. At a school meeting, Principal Becher (Greg Germann) announces that due to budgeting constraints the music program will be cut and music teacher Marty (Henry Winkler) will lose his job. In order to save Marty’s job, Scott promises to raise the $48,000 that it would cost to keep the music program running. Since Scott has a wrestling background, he decides that Mixed Martial Arts can earn him some real money and it might impress sassy school nurse Bella (Salma Hayek). Through a night citizenship class he teaches, Scott meets Nico (Bas Rutten) a seasoned MMA fighter who agrees to train him. Kevin James isn’t one of my favorite actors or comedians. His jokes aren’t especially funny and he has the acting range of Kristen Stewart. In Here Comes the Boom, he was bearable and occasionally had a funny one liner. Salma Hayek is adorable as the love interest, but her character’s never fully flushed out and her presence isn’t really necessary. Surprisingly, Henry Winkler and Bas Rutten steal the movie. As Marty, Winkler looks adorable in a series of old man sweaters and vests. His character is charming and flighty – he spends most of his time fixing instruments and making his own apple sauce. Rutten has his own charm. If you’re a fan of MMA, then you probably know Rutten’s history or have at least seen his hilarious self-defense videos (see below). In Here Comes the Boom, Rutten teaches MMA, but also works at a gym teaching women’s yoga, disco street fighting and disco spin classes. For such a huge tough man, it’s nice to see that he can have fun and laugh at himself. Several MMA personalities play themselves including Joe Rogan, Mike Goldberg and Chael Sonnen. What I find strange about Here Comes the Boom is that it’s marketed as a family movie despite the potentially violent content. The potential violence could alienate some moviegoers who think that MMA is all blood and gore. At the same time, it’s smart of the UFC to get involved with a family friendly movie. Warrior was a fantastic MMA movie and drama that failed financially, but excelled critically. The second time around the UFC is appealing to a broader audience and featuring family friendly actors like Kevin James and Henry Winkler. It’s a good strategy – well-played Dana White. 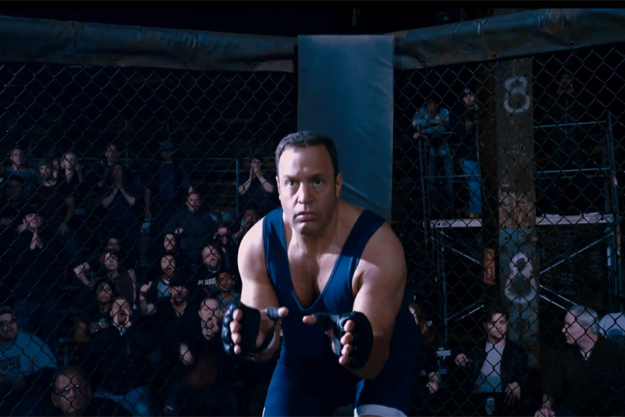 Overall, Here Comes the Boom is good family fare, but it’s not memorable…not Bas Rutten self-defense memorable anyway.